For months, a group calling itself Anonymous has been running giggling circles around the Church of Scientology. At the same time, caution is always advised - masks are worn, everyone is named Anonymous. People are advised to park far away or take public transit, and use the buddy system to avoid being followed home. The precautions seem almost a little over-the-top. According to the latest from Anonymous, the precautions are needed, and the backlash has already begun. 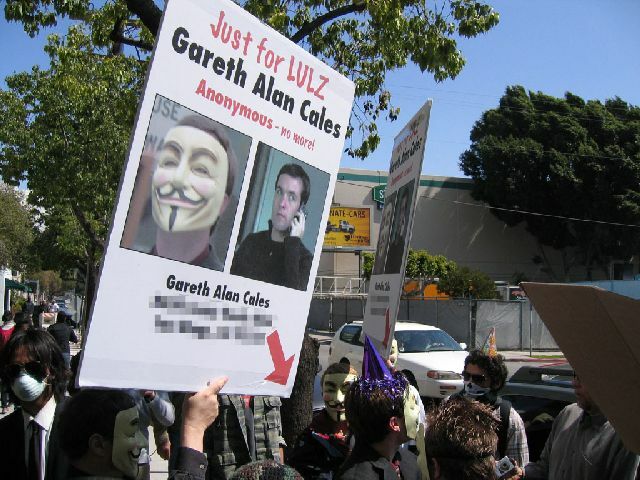 Anonymous members are being publicly outed, and emails warn of threatening letters and DVDs being sent to Anonymous members by the COS.
After the jump we are printing the letter from Anonymous warning of the threats, along with the story of one "outed" Anonymous organizer who has permitted LAist to publish his story. Anonymous is doing nothing illegal. Again, Anonymous is doing nothing illegal. The Church of Scientology's legal representation is trying to suppress free speech by scaring people with these packages. They failed, twice, to get an injunction and a restraining order in Clearwater. If they had a legal grounds to stop you from protesting, those injuction/order attempts would have been successful. They failed, so these packages they are distributing to people that have gone to protests are misrepresenting the facts. Long story short, don't fall for their tricks. Mudkip." Previously, other organizers and some press knew me by the name Ryan. I no longer have any reason to conceal my identity, and this is my story. About a day after the anonymous video came out in January, "Message to Scientology," I saw it on drudgereport.com. It had been mirrored on breitbart.tv and Drudge had linked to it. I was immediately interested, as over the years I had heard about Scientology. There were just a few weird things here and there. In this case, an eery sounding video led me to want to find out more. I Googled Anonymous and was surprised at the number of sites that came up. Somehow I found myself in the "Project Chanology" Wiki page. This was towards the end of the denial of service Civil Disobedience, and so I found myself looking at more appealing options like "IRL Raids (protests)." I went on to the IRC server at the time and found myself in #xenu. There were a number ofpeople consistently talking about the project and I watched as a number of people used their personal computers, without the use of botnets, to use acts of Civil Disobedience to raise awareness of the problem with Scientology. At no point did I ever take part. At one point I was asked to assist with some press related things. This set off a relationship with several other Anonymous who were helping look after other regions. I discovered that Southern California did not have an adequate "IRL Raid" being planned, so I decided to help work on it. We created an irc channel, #socal, and recruited Southern California folks in to it from other IRC channels. We set up a SoCal wiki page with contact information so an e-mail list could be generated. A Myspace info page was set up as well as two Facebook groups to recruit people. Ultimately we had a couple hundred emails on the list. Another Anonymous, Rorschach, who has been a long time channer and veteran Encyclopedia Dramatica member, had also been on another list. We merged the two together. movement began to swell. February 10th was set as our protest date to coincide with the others, and we made calls to find out about permits and such. Somewhere in here I was put in touch with Tory Christman, ex-Scientologist and former-OSA handler/operative, who indicated she would attend our demonstration. We ensured that we needed no permits, and much progress was made towards a successful demonstration. We held IRC meetings and generated great interest. Multiple calls to the police from several sources confirmed that we did not need to obtain permits for our demonstration. I did some fliering with a friend on February 7th in downtown San Diego.I did a KROQ interview on February 8th, 2008,2 and was in the LA Times: "... a caller who identifiedhimself as a spokesman for the group Anonymous told a Times reporter that the group was not to blame." By this time all Internet-based civil disobedience was at a close. I am sure some nefarious faxing and calling continued, but that was out of my domain, and out of my sight. On February 9th, I drove up to Los Angeles with the friend from February 7th and stayed at Rorschach's house. We ate at a restaurant near his home and made good conversation with the bartender. We chatted Online with people and received a number of calls to the "Partyvan" disposable phone that Rorschach had set up. Everyone was in good spirits. On Sunday morning, myself and my friend woke up early and went to Breakfast down the street. We then came home and got dressed for the demonstration. Rorschach proceeded to the Starbucks in the mall at Hollywood and Highland, and assisted those Anonymous in descending to the demonstration site. My friend and I went searching for Guy Fawkes masks but were unsuccessful. Fortunately, two masks were available to us when we arrived at the protest site. I know for a fact that between those first 30 seconds on which I had no mask, and the February 3rd scouting, they got my picture a number of times. At the February 10th protest there was an "Ice" van set up for a company that does not exist. Information about this van can be found on Youtube.4 We are not sure who was operating the van, but its presence with tinted windows (and obvious purpose) was disturbing. There was enormous coverage of our event posted on Youtube, including articles in many publications. The pictures for a front-page article in Radar magazine5 were taken in Los Angeles on 2/10. David Sarno of the LA Times wrote an outstanding article6, which made the front of the Entertainment section, that was based partly on the 2/10 demonstration. There was very little visible handling at the Hollywood 2/10 raid. There were a lot of OSA operatives recording protesters and attempting to catch faces. We proceeded from Sunset and LRH Way to three locations on Hollywood Blvd., making sure our message got out there extensively. The only incident of violence that occurred was perpetrated by a Scientology supporter. The Youtube videos7 8 have the best coverage of this. The authorities were very cooperative through this whole process, and it is worth mentioning that the church hired no off-duty law enforcement (though they did have private security). commentary requests from the media as did other SoCal anonymous members. On February 16th, the evening before my 22nd birthday, I met with Graham Berry for the first time. We discussed potential courses of action. The same evening, an open party was hosted at which about 20-25 Anonymous members attended, as well as Tory Christman and Graham Berry. This was a masks off situation, and to this day I believe that no one who was openly in our group was a plant. There may have been a private investigator tailing people, but not openly. It was at this dinner that I met a number of fellow Anonymous without their masks for the first time, and to this day I am glad that we made that connection as it has built some lasting friendships. On February 27th, a website called Exscientologykids.com went live, administered by Kendra Wiseman,Jenna Miscavige Hill and Astra Woodcraft. I was touched by Kendra's personal story. Socal Anonymous had a demonstration planned for March 1st outside of a Citizens Commission on Human Rights (CCHR) awards dinner. CCHR is a known front group funded by Scientology, and their name is misleading as to their real purpose: ruining honest Psychiatrists. It says as much right on their website.9 Kendra Wiseman's father is the president of CCHR USA, so I made a sign that was specifically for him, to highlight the church's policy of Disconnection: "Bruce Wiseman, why won't you be there to walk Kendra down the aisle? Exscientologykids.com" Disconnection is the church's policy by which anyone who leaves Scientology publicly is forcefully cut off from their family and friends. During the 3/1 protest, at which we had about 30 people and to which I brought an Anonymous by the alias "NigraJustice", we identified a black SUV across the street from the Hyatt at which we were protesting. The Hyatt Century Plaza hotel on Avenue of the Stars was our protest location. Upon approaching this SUV with another anon with a camera, and one additional protester, the SUV drove off. The gentlemen put their suit jackets in the windows, rolled the windows up, put their cameras back in the car, and screeched out of the drop-off area. The police in charge of this jurisdiction were exemplary in every way and deserve to be commended. Sometime around March 11th, Scientology posted a video labeling Anonymous a terrorist group, and blaming them for every single act of vandalism that had been allegedly perpetrated over the last two months. Around this same time they also filed for an injunction in Clearwater against Anonymous protesters. This injunction attempt failed twice, ultimately resulting in a successful 3/15 protest in Clearwater. They went so far as to make up easily verifiable incidents, such as the egging of a Boston church. Calls to the Boston PD indicate no such complaint was ever called in. This lack of credibility coupled with their previous lies over the last 60 years makes it a simply matter to acknowledge that most of their claims are either fabricated, or self-inflicted. The evening of Tuesday March 11th, Scientology held a "Confidential OSA Briefing." Operatives on the inside leaked the occurrence of this meeting in several cities, including New York City, Boston and Los Angeles. We sent 15 people to welcome the gathering Scientologists. Rorschach was somewhat rude to the security detail, but all accounts indicate he was just rude and not threatening. Video allegedly exists that corroborates that account. proceeded to take a nap for about 4 hours. I woke up at 11:30 or so and began planning my afternoon. I moved my car to the curb directly across the street from Rorschach's and parked it at about Noon. When I left at 1:30, I noticed very obviously that the two middle air conditioning vents had been tilted all the way up. This is not something that I, or anyone I have spoken to, will do. Generally people just turn the A/C off. I thought I might be a tad paranoid until later. That same day I was speaking to the class of someone who I knew only as Blvdnights. I was scheduled to speak to his class at the Art Institute of California, Los Angeles. Tory Christman joined me and we had a great meeting with the students, all of whom were very interested in what we had to say. I posted some fliers in their cafeteria area and headed down to the Farmer's market around Fairfax and 3rd. I distributed fliers with Blvdnights and another Anonymous, as well as Tory. Thursday evening, March 13th, three videos went online identifying Southern California members of Anonymous. The three people who were publicly identified were Rorschach, Blvdnights, and Nigrajustice. All three are mentioned above, so I had close personal contact with these individuals. This was my first indication that I was likely no longer safe. Rorschach was identified as "Sean Carasov." Blvdnights was identified as "Ryan Benno." Nigrajustice was also identified but I am leaving his name out. The following day two Anonymous from Clearwater were also named, but I do not have contact with those individuals. On Friday the 14th, I spoke with Rorschach sometime after lunch and immediately noticed he sounded markedly out-of-sorts. I asked if everything was okay and he gave me a very choked-up and somewhat irate account of having woken to go into his yard to find and feed the feral cats that he cares for. He told me that he had found a pool of vomited blood and unidentified matter that looked like tissue - rather than chewed food - next to the dish for his cat Mudkips. He immediately suspected foul play since the food smelled like ammonia. This happened the morning after he was publically identified by Scientology on numerous sites. They have a well documented history of animal and pet abuse used to send critics a "message." Sean lives around the corner from a Co$ 'Mission,' making handling a simple matter. I later advised Sean that since Mudkips had not returned and he sounded stressed out and angry, he should not come to the demonstration on Saturday, as the Church would no doubt attempt to provoke him. He reluctantly agreed that his distress could cause a scene if they were to bait him. Friday evening after work, I drove up to Hollywood and picked up another anon who goes by the alias Cora. We went to a dinner with several other anon, a documentary crew and a magazine writer. It was great to meet with everyone and served as a final meal under the premise of normality. After dinner, I stayed at Cora's apartment. The following morning we departed for the demonstration. The demonstration was already underway when we arrived. A giant television screen had been set up to face the public, and they had a whole display up. The church might have even had a few dozen people, possibly a hundred at most at any one time. There was a 10 foot white tarp up around the entire compound blocking view, which had been there since Tuesday or Wednesday. There were speakers that, any time a chant would start, the church would crank way up to try and overwhelm our noise. Sadly for them, 600 people are hard to block out. Anonymous spoke with Fox11,10 NBC4, and a Spanish speaking Anon spoke with Telemundo. We also gave comments to the LA Times, LA Weekly and the aforementioned magazine writer. At first, the sidewalk on Scientology's side was blocked off. The off-duty, Scientology paid cops were also not allowing people over there. After the true, on-duty police arrived we were permitted to stand over there. Numerous fliers and pamphlets were passed out to passing drivers, and everyone was in a very good mood, despite the fact that L. Ron Hubbard Way's sidewalks were illegally closed to us. At some point, a private investigator or OSA agent with a gun was spotted, called out with a massive sign, and taken aside by some police. He apparently produced a permit, but my understanding is that he should do a better job of concealing it. He caused undue stress by having it visible. A photo of me with a mask on was juxtaposed with a photo of me without a mask on. My home address was then listed. Pictures and video will be included with this document. Now I have to say, they picked a fantastic picture of me. I had a sinister look on my face, was talking in a cell phone, and was glancing around to see if I was being monitored. Clearly I had proper cause for concern about being followed. Through all of this I remained perfectly calm. About 2 minutes later I crossed the street to verify the legality of there display of my personal information. Sergeant Guillary informed me that it was an act of "freedom of expression" that they were performing, and so I let the matter drop. As I was walking away to contemplate my next move, the Sergeant called me back over. He stepped out of his vehicle and we spoke privately. He stated that I may want to work out whatever issues I might have with the church. I indicated that I had no issues with the church and no prior involvement with them; my issue would be resolved when they were stripped of their tax exemption. The Sergeant praised my sense of idealism and made comments about how difficult it can be to change the system. He then went on to indicate that I might want to call a certain number, because there are two sides to every story. Some people were going to "call me," so I might want to call them beforehand to give my side of a story. I had no idea what he was talking about. I thanked him all the same and indicated I would call him in the evening. I stood about 10 feet off to the side of his vehicle, contemplating my revealed identity and deciding on a course of action. As I stood there for 5 minutes or so, the only time I was alone through the entire demonstration, a male, middle-40s/early 50s, somewhat out of shape OSA operative said behind me "Hey Gareth, I guess your buddy Sean couldn't make it today." He said "You know who I mean." I replied, "I don't know who you are talking about." He then laughed as he walked off. As I said earlier, Sean's cat had been poisoned the previous morning. I assumed that he was talking about this incident, and I was disgusted at how low they would sink. I texted back and forth with an Anonymous who I needed to meet up with. I also had an offer for a vehicle to leave the area. I began making arrangements to depart, as my outing was causing an enormous distraction for the other Anonymous that were present. As I stood across the street, the two sign carriers remained opposite, but mirroring any moves that I made. As I crossed back to the LRH side of the street, the two sign carriers approached and fell in step. I made arrangements to get some room from them and began walking back up to Sunset Blvd. As I approached, an Anonymous associate obtained his vehicle. I was escorted by a second associate and a number of other Anonymous. Ultimately, the sign carriers targeted an individual other than myself; I had taken my party hat off and I believe I managed to evade their view in the sea of people. As soon as the associate pulled up, the second associate and I hopped in the car and we took off. We circled the block once and picked up Cora. As we took off, a Silver Toyota Sienna began following us. We made a long circuit, returning once to pick up a final associate. The five of us left the area with the van still in check. Thus began a car chase; our driver ducked in and out of parking lots, weaved through traffic and did other such necessary actions to shake the vehicle following us. At some point we managed to lose them. The action was fast paced enough that all we knew at the time was the plate started with the number "6". As the car chase was still going, I was on the phone with the magazine writer and David Sarno of the LA Times. They both took notes as far as I know, and advised calling the police. We spoke with Tory Christman during this event as well, and Graham Berry arranged that if we were to return to the picket the cops there would stop the vehicle following us. We managed to lose the vehicle before this was necessary. As a followup note, going back to the sign bearers, I understand that Mark Bunker of XenuTV recorded the individuals holding my signs going back inside the Scientology center. This confirms that it was indeed Scientologists and not Anonymous demonstrators. We were headed south on the 101 at this point, and pondering our destination to settle and plot a course of action. We decided to go to Graham's home as it seemed he was headed there himself. Upon arrival, no one was home, so we went to a Denny's to eat and wait for him. He arrived at Denny's at about 4:45pm. He took 6 pages of notes on my experience that day; at the time everything was still fresh in my mind so I was giving him many word for word quotes. Around 5:00pm Graham called Sergeant Guillary for me. Their conversation was apparently very polite and the Sergeant had some words for me. He proceeded to apologize profusely for our earlier conversation, as he had thought I was Sean Carasov. He told me that Sean had been arrested and was currently being taken to the Parker Center. We found out later that he ended up meeting with the "Major Case" squad, which I understand works with the FBI. His Miranda rights were read to him after he arrived at the Major Case squad, just before he was questioned, and not before. After they finished with him he went to Parker Center for processing. We wrapped up our Denny's meal. The three unnamed associates left. Myself, Cora, Graham Berry and "Mr. X" drove down to the station, taking a moment to drive by the protesters at Jefferson Blvd. which were getting underway. They looked as though they had about 200 people at that protest, meaning about 2/3 of the Anonymous had predictably gone home. It also appeared to have showered briefly. I will leave it for someone else to tell how horrible the police were at the Jefferson Blvd. event, since I was not there. On arriving at the police station, Graham and myself went inside. We were both admitted to the visiting area, but only Graham, as an attorney, was permitted to speak with Sean as visiting hours were over. He made arrangements for a bail bondsman to come by, and collected as much information from Sean as possible. Sean's story is available elsewhere on the net, but he was charged with Felony "Criminal Threats" based on a comment he allegedly made Tuesday (we still do not know what the threat was). After departing the jail around 6:30, I called another associate. While on the phone, one of the people he was with phoned Graham. Both indicated that they were being chased by a Silver Toyota van. It turned out to be a Sienna with license plate "6AUP602". Based on this information, we believe it was the same vehicle that had followed us. They had two photos of the vehicle chasing them while they were in a cab. The cab driver attempted to lose the van but was unsuccessful, ultimately dropping them off at Union Station where they hoped to lose the private investigator. We turned ourselves in the direction of Union Station and headed their way. 5 minutes prior to our arrival, they phoned to let us know that they had been stopped in the Station. The Private Investigator had told their security that he had good reason to believe that the Anonymous individuals were carrying weapons, a blatant lie. The Anonymous offered to be searched, but security declined and instead told them they could not proceed with their masks on. Everyone sat and waited while the Transit Authorities showed up. Two sheriff's deputies that were also part of the Department of Homeland Security arrived. Upon our arrival, Graham, myself and Cora rushed inside. The Private Investigator had been told to leave and he apparently left quite frustrated. Graham convinced the deputies that our members needed a safe area to change and remove their masks if they were going to be forced to travel maskless. They were taken to the back room and courteously monitored as they changed. After this success, we parted ways and Cora and I ultimately made it back to my vehicle. I dropped her off and went to stay with another associate. I got a great night's sleep, and the following day made calls to a number of press organizations. I informed them what had happened to me, and that they were now permitted to use my real name: Gareth Cales. I do not care that Scientology has my identity now; it also does not bother me that some Anonymous out there will disown my allegiance now that I have a name attached to my alias. The fact of the matter is I am on the same side, I can do more with a name, and the Church will soon regret the PR Flap that comes as a result of outing the SoCal anons. I went home in the early afternoon on Sunday and had a night of chuckling over IRC. The next couple of days were largely uneventful. I met with HR on Monday and explained my situation to them. They documented it in full and asked what they could do to help. Tuesday evening, March 18th, a video was published online exactly like the five previous videos that I mentioned labeling people as members of Anonymous, and by association, "Terrorists." This video had my photo and name in it, effectively sealing my outing. On Wednesday, March 19th, I noticed several things that may or may not have been coincidences. Some will likely call me paranoid, but I am simply noting these things in the event that any of them turn out to be something more than just odd. This morning when I went to shave, I noted that the remainder of my shaving gel had been expelled in to a spot next to the shaving gel canister. It was a small amount and had foamed up like it was done several hours before. The canister was now empty. When I went downstairs to my car, I noticed that the gas cap had been opened and unsealed. I replaced it and went to work. At around 2:00pm, I received a call from Facilities. They said that Security had noted that my gas cap was undone. I went outside and found it had, and replaced it again. I had a conversation with our head of security and he had been informed of what was happening to me. He wished me luck and said he would keep both his and his colleagues' eyes open. This is my story thus far. As it continues I will add further text, but so far it has been very eventful and full of foot-bullets for Scientology. Anyone interested in contacting me about this story can e-mail hitsut@gmail.com for comments. Posted with permission of Gareth Cales. Photograph courtesy of Gareth Cales. February 10th's protests. To this day, no Anonymous has ever taken credit (don't forget, an anon will always take credit for what [s]he does as it is part of our culture) and so I firmly believe we were not involved. In the past, the Church has attacked itself to discredit critics, so I wouldn't rule out that possibility. See LAist's previous coverage of "Anonymous."